Wow, I have not had any postings since the end of November! Hopefully I can start testing new dishes again and post more frequently this summer. 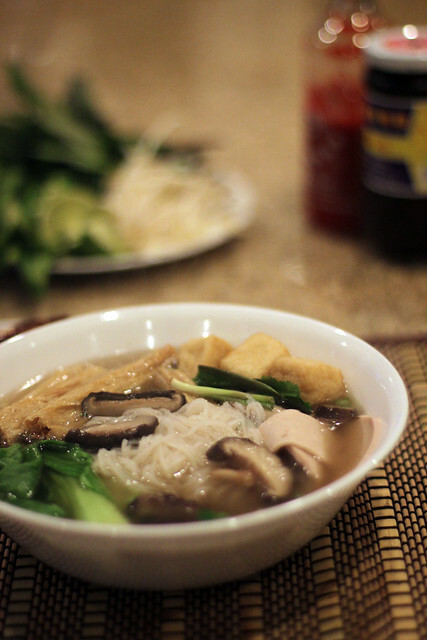 Vegetarian Pho is delicious. The best thing about this recipe is it is super easy to make and takes much less cooking time than making regular Beef Pho. 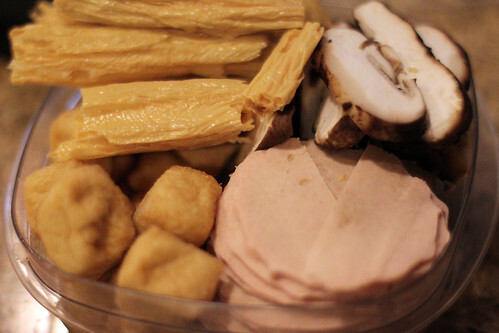 For the “meat” choices, just go to your local Asian grocery store and pick up some vegetarian “meats,” mushrooms, and tofu to use as meat substitute. You can use anything you like for this recipe. 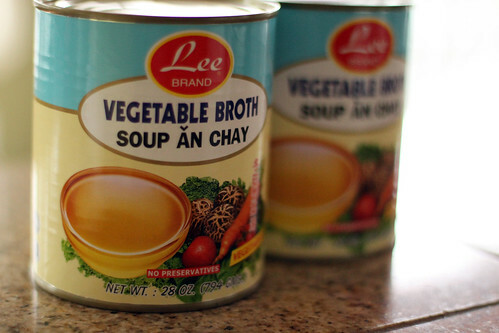 If you have guests or family members that are strictly carnivores, make this broth and you can buy some thinly sliced top round and or chicken for them while you enjoy the “meatless” options. They probably won’t be able to tell the difference! Set oven on BROIL and Broil onion and ginger until charred. Rotate occasionally. After it is charred, let it cool then remove the charred part and set aside. This is the lazy way to do it. For optimal results, char over grill. Put the coriander seeds, star anise, and cloves on a small frying pan and toast over Low heat until fragrant. 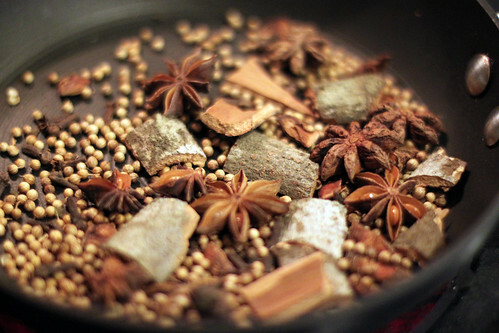 Once it is done, put the spices in a tea ball. If you don’t have a tea ball, you can put it in a cheese cloth or foil and poke holes through it. Note: I noticed at the Asian grocery store, they sell Pho Spice packs with everything you need and it is cheaper than buying all the ingredients individually. Fill the stock pot with vegetable broth and water. Add rock sugar, salt (to desired taste) and bring broth to a boil. Add onion, ginger, and tea ball of spices to the pot of broth and let simmer for an hour to release the aromas and flavors. After an hour, clean and slice Shitake mushrooms and add to the pot. 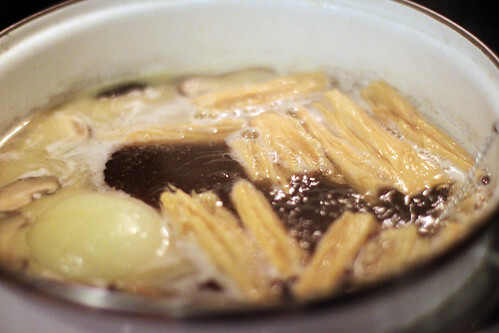 If using dried bean curd sticks, break into pieces and add to the pot to make it tender. 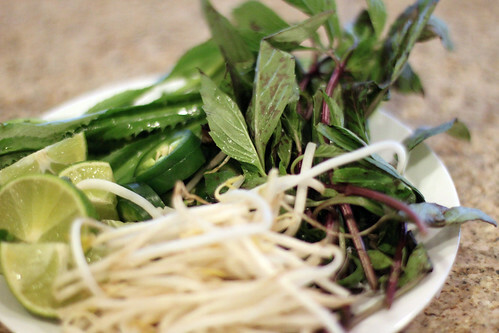 This step is optional, but you can add 1/2 stick butter to create a rich pho broth taste. 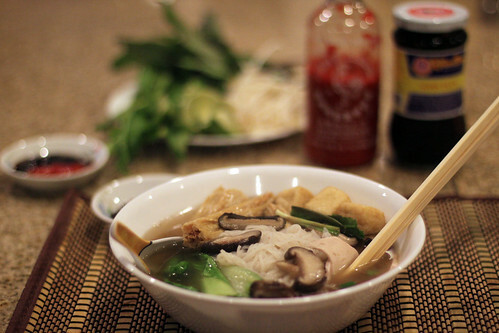 Fill up another saucepan with water and bring to a boil.When boiling, mix the Pho noodles for no more than 10 seconds and place it in the bowl. 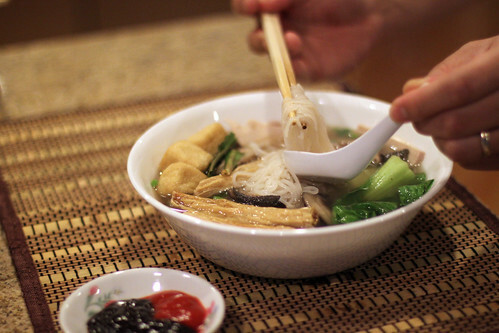 Add desired vegetarian meat options and garnishes then pour the broth into the bowl and serve hot!